Summary: Yesterday, crews took advantage of favorable weather to work directly on the fireline along the south half of the western flank on White Bird Ridge to keep fire out of the Rapid River drainage. 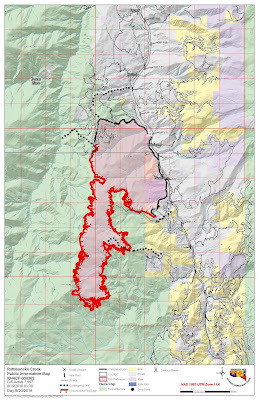 Firefighters scouted for line locations suitable for heavy equipment to construct perimeter line and still protect sensitive resources on the southwestern end of the fire. Firefighters finished structure assessments in Shingle Creek, Papoose, the Rapid River area, and Round Valley. Today there is a RED FLAG WARNING for lightning. With the help of aviation resources, crews will continue to secure direct line on White Bird Ridge between Pollock Mountain and the Adams/Idaho county line as long as lightning does not threaten their exposed position. These firefighters will be “spiking out” on this remote section of line as weather allows. Heavy equipment will construct indirect fireline on the south flank east to Hwy 95, using existing roads where feasible, to limit spread potential any further south. Contingency plans for point protection will be made in Elk Lake subdivision. Higher humidity and precipitation from passing thunderstorms is expected to moderate fire behavior. Community Meeting: Tuesday evening 6:30 pm Mountain Time. New Meadows High School. Meeting will be livestreamed on Facebook, see below. Resources Threatened: Private property and structures in the Pollock, Pinehurst, Hillman Basin, and Elk Lake areas remain threatened, as well as state and federal infrastructure (Highway 95) and natural resources. Evacuations/Closures: Residents in Hillman Basin and Boulder are in “Go” status. Residents in the North Pollock, Elk Lake and Pinehurst areas and residents along Hwy 95 from mile marker 167 to 177 are in pre-evacuation status (“Be Set”). Smokey Boulder Road to Railroad Saddle is closed. Both Idaho and Adams counties use AlertSense for emergency alerts. In Idaho County, call the Sheriff’s Department @ 208-983-1100 to enroll; in Adams County, visit https://bit.ly/2AU0C5R to sign up. Additionally, the Nez Perce-Clearwater and Payette National Forests have area closures in effect, including portions of the Hells Canyon National Recreation Area (NRA); see https://bit.ly/2ATSand, https://www.fs.usda.gov/payette or Inciweb for more details. Announcements: Stage 1 Fire Restrictions are in effect; use the following link for specific restriction information https://bit.ly/2ag2SUy . For public and firefighter safety, please adhere to all safety signage and speed reductions. Do not stop along the highway corridor near the fire. For road conditions and closures http://511.idaho.gov/.